One of the most celebrated writers of criticism in nineteenth-century Spain, Leopoldo Alas employed his satirical talent to powerful and humorous effect in fiction as well. In His Only Son, Bonifacio Reyes, a romantic flautist by vocation—and a failed clerk and kept husband by necessity—dreams of a novelesque life. Tied to his shrill and sickly wife by her purse strings, he enters timidly into a love affair with Serafina, a seductive second-rate opera singer, encouraged by her manager who mistakes Bonifacio for a potential patron. Meanwhile, Bonifacio’s wife experiences a parallel awakening and in the midst of a long-barren marriage, surprises them both with a son—but is it Bonifacio’s? In the accompanying novella, Dona Berta, an aged, poor, but well-born woman forfeits her beloved estate in search of a portrait that may be all that remains of the secret love of her life. 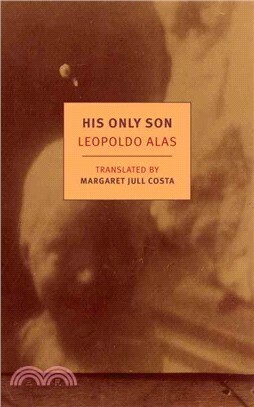 Leopoldo Alas (1852–1901) was a novelist, journalist, and literary critic. Known for his biting and often-bellicose articles, he was considered one of Spain’s most influential and feared critics. He wrote some of the greatest Spanish novels of the nineteenth century, including La Regenta and His Only Son, and is considered the father of the modern Spanish short story. He died in Oviedo. Margaret Jull Costa has been a translator of Spanish and Portuguese literature for nearly thirty years. Among the authors she has translated are Jose Saramago, Javier Marias, and Eca de Queiroz. She has won many prizes, including the PEN Translation Prize. In 2013 she was invited to become a Fellow of the Royal Society of Literature, and in 2014 she was awarded an Order of the British Empire for her services to literature. She translated Tristana by Benito Perez Galdos, which is available in the NYRB Classics series. She lives in the United Kingdom.